The Master’s department of Baku Slavic University has been functioning since 1997. Master course programs are as follows: «Philology (linguistics)», «Philology (Literary Criticism)», «Translation (on languages)», «International relationships», «Regional geography», «Journalism», «Language and literature teaching», «Foreign language teaching», «Pedagogics», «Teacher of primary school». Training course is conducted in Russian and Azerbaijani languages on a full-time basis. According to the state educational master programs: Foreign language, Psychology, High school pedagogics, subjects on the speciality are taught, scientific-research and scientific-pedagogics experiences are conducted, scientific research work is carried out by the students at the specialized scientific council. A special attention is paid to the young generation who works on scientific research work carried out by students and thesises are defended in specialized council. A scientific research practice of the masters holds in the specialized department, scientific research laboratories and culture educational centres of the university. During the practice articles that were prepared by the masters are printed in the collection of articles called «Problems. Researches. Perspectives». The Masters who are involved into scientific pedagogical practice teach specialize subjects at the bachelor degree. The Masters take an active part in different conferences held constantly by the Baku Slavic University in our Republic. Our masters are selected for their activity in scientific conferences held by the Baku Slavic University, Nakhchivan State University, Ganja State University, Sumgait State University and Caucasus University. 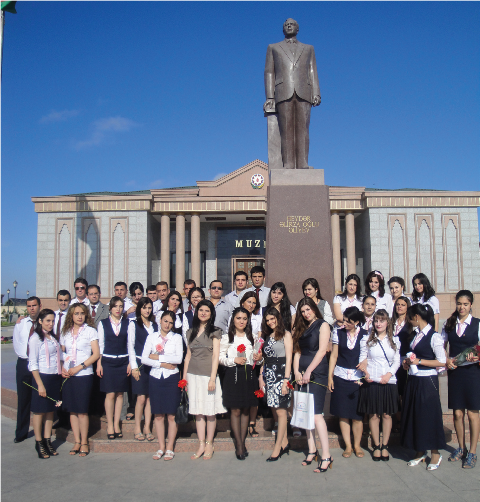 Also Masters’ International conference dedicated to the birth of the national leader Heydar Aliyev is held by the Masters Department of the University. Since 2002 meetings have been holding constantly in the frame of «Debate Club» with the well-known scientific and cultural figures, political figures by the Masters Department of the Baku Slavic University. Discussions on different themes are held during these meetings.The Masters’ Council of Baku Slavic Slavic University have been working as a leading authority since 2000. Council members are elected among the post-graduates who study in various specialities in the Master program and have high success rates in the implementation of master program training, who are interested in research work and take an active part in the social life of the university. Council members participate actively in the improvement of the educational work among masters; in the organization of cultural events, scientific conferences, seminars, in holding disputes and discussions, the charity events; in the publishing of the collections of the masters’ scientific articles.